Direct Freight – Page 3 – Make your loads available anytime, anywhere. We’re a world of consumers; every day we need more and more stuff to take the place of the stuff we use. Stuff to eat, stuff to use in our homes, stuff to drive, stuff to wear, stuff for entertainment, and stuff to read. We don’t always think about how all this stuff gets to the stores near us or to our doorstep. It’s just there when we need more stuff. The fact is, there are several ways that products get shipped around the world or locally, some even using more than one shipping method. 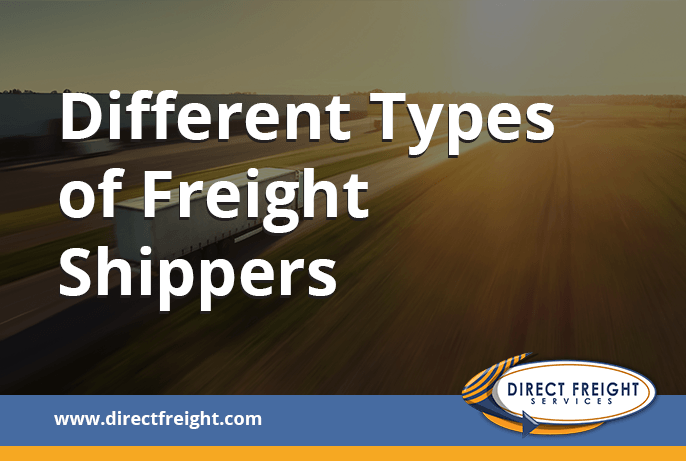 So what are the types of freight shippers that bring us all our stuff? First, let’s define freight. Freight is any shipment that is larger than 30”x30”x30” and weighs more than 150 lbs. Packages that are smaller than that would be expensive to ship in the same manner as freight and are usually shipped via parcel, i.e. UPS or FedEx. Freight is loaded by pallet or can be loaded directly onto the floor of the truck. Floor-loaded freight is loaded into the truck by hand where pallet-loaded can be loaded into the truck using a forklift. Air freight shippers ship cargo just as it sounds, using planes. Although it is an expensive way to ship cargo, it is fast which can be more important than the cost. Air freight shippers can ship domestically or internationally. Shipping products via ship is the most popular way to ship cargo because it’s the most inexpensive. However, it does take the longest amount of time. It’s the oldest way to ship freight around the world. Usually, large containers are used for shipments that can be loaded onto trucks or trains at ports to bring the products to their final destinations. Ocean freight shippers can ship internationally or domestically. Shipping products by train may take a little longer than by trucks, but as they don’t have to be concerned with running into traffic or auto accidents, it can be faster. Because trains use less fuel to pull many cars than the same number of trucks would, they are more economical and more eco-friendly than trucks. Rail freight shippers can ship domestically or internationally to Canada and Mexico and are often the second leg of transport of products coming in on container ships. Ground freight shippers use trucks to transport cargo, especially to local areas but many deliver cargo across the country. A standard-sized truck can carry a maximum of 26 pallets. Standard dimensions of a single pallet are 48”Wx40”Lx48”H. Anything above 48” high is considered a double pallet. Full Truck Loads (FTL): Typically a load of 24-26 pallets. Because it is a full truck, shipments can be made directly from pick-up to destination. Benefits of FTL include the use of refrigerated trucks or the ability to ship over-sized loads. Less Than Truck Loads (LTL): This type of shipping is for cargo that is larger than a parcel but smaller than a truckload, usually 1-6 pallets. This is the most common type of ground shipping. Along the route, cargo is transferred to other trucks and is shipped through local terminals. Because of the shared payload, shipping usually takes longer than full trucks which are shipped directly to their destination. It’s cheaper than other ground shipping methods that use trucks. Partial Truck Loads (PTL): Partial truck loads are generally between 6-18 pallets. Costs are usually comparable to LTL rates but have the benefit of FTL shipping times because they may be transferred to a different truck but usually they are not. Freight shippers are constantly looking to improve ways to ship cargo as well as the logistics involved with moving freight. Driverless vehicles and even drones may be on the horizon but the tried-and-true shipping methods using planes, trains, and trucks remains the most cost-effective and efficient ways to get us our stuff. If you’re looking to ship your product around the state or around the world, Direct Freight Services can help. Go to directfreight.com or call (888)894-4198 and find a truck for your load or a load for your truck. Start your free trial today! The shipping industry of today is a trucker’s market. There’s a shortage of CDL drivers which is good news for drivers looking for loads―there are a lot of them out there. However, to be a successful owner/operator in the trucking industry, you have to find the right loads. It’s not just a matter of finding any load but finding the right one. For that, you need more than just any load board. Before you begin your search, think about what kind of client you’re looking for. The goal is to find high-paying loads that are actually going to make you money. If you have an idea in your mind about what you’re looking for, you’ll increase your chances of finding it. Are you looking for a large, well-known company? One with a good reputation? A client that you can work with on a regular basis? One that ships in areas where you want to work? Do you want to work with a freight broker? Do you offer specialized services such as moving oversized construction equipment or refrigerated services? With the answers to these questions in mind, it’s time to peruse the multitude of load sites out there but where should you begin? There are so many load sites available online that it’s difficult to know where to begin. Free load sites are tempting, after all, why pay for something when you don’t have to? There’s a good reason for that. Free load sites have to make money somehow, and they usually do it by having lots and lots of advertising on their websites, selling things other than load information. Some free load boards are just lists of free load boards. Most loads that are found on the free sites are not posted directly to the site from shippers or brokers; they come from a load sharing service. Is the poster a member of TIA (Transportation Intermediaries Assoc. ), i.e. a broker that agrees to a high standard of business ethics? With this information in hand, you’ll be able to find the right loads. You’ll also be able to maximize your time by scheduling loads for your trips back too. If you want to land these jobs, however, you have to make sure you’re the right driver. Begin with your insurance. A shipper wants a driver with good insurance that includes freight insurance. They’re trusting you with their freight and want to be covered if anything goes wrong. Insurance goes hand-in-hand with your safety rating. A driver with an excellent driving record and safety rating will be hired over one with poor ones any day. Always be professional and be mindful of your reputation. Drivers with a good and dependable reputation will get the higher-paying jobs. 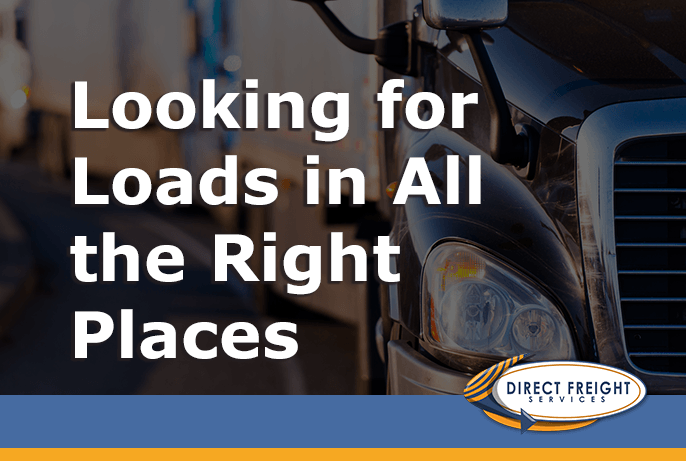 If you’re looking for a load site that’s not just any site, Direct Freight is the place to go. It matches loads and drivers by using pertinent information so you can maximize your driving time and your earning potential. It uses state-of-the-art tools to make the system work for you, including alerts via text or email for when new loads are posted. Direct Freight is so sure that their service will be a tremendous benefit to you that they offer a free trial for 15 days. Go to DirectFreight.com or call (888)894-4198 to find out how you can get started finding the right loads today! 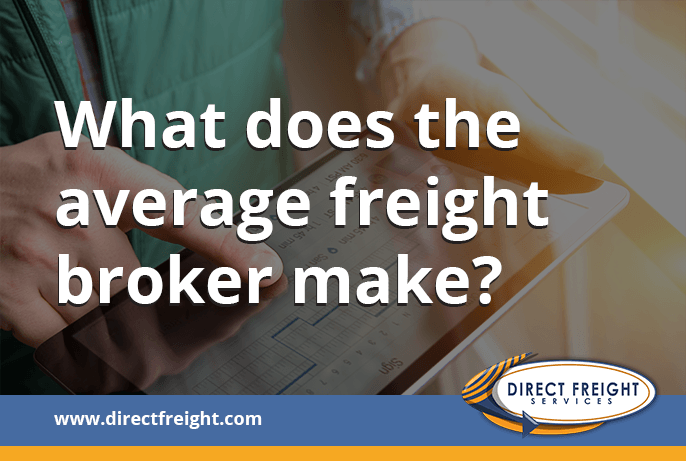 What Does the Average Freight Broker Make? Whether you’re new to the shipping industry and are eager to learn a new business, or you’re a truck driver looking to get away from those long hauls away from your family, the job of freight broker is an exciting option. As a freight broker, you work for yourself, create your own hours, and depending on your dedication to the job, you can make a great deal of money. When a company has a shipment they need to make, they pay a freight broker to move the freight. The freight broker then pays a carrier to ship the product for less than what the original company paid. This is the freight broker’s “spread” or his profit. This profit, minus the operating costs is the salary of the freight broker. A freight broker is the crucial link between shipppers and carriers, sort of a matchmaker between the two. Freight brokers are also involved with the logistics of shipping. They negotiate shipping rates, track shipments, and keep track of deliveries and pickups. They must make sure everything goes off without a hitch and is done in accordance with all laws and procedures. 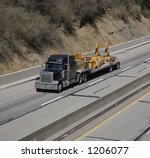 How Do I Become a Freight Broker? Register your company. You must register as a business or fill out a DBA (Doing Business As) form. Make a plan. To obtain any kind of financing, you usually need to show the lender a business plan. A business plan also helps guide you through the early stage of your business. Get a USDOT number. This is a requirement if you want to operate as a freight broker. You do this by filling out an application with the Federal Motor Carrier Safety Administration, or FMCSA, form OP-1. There’s a fee, usually around $300. Get a surety bond. A surety bond is a type of insurance. It guarantees that carriers will be paid for their work. If for some reason, a shipper refuses to pay a carrier, you would be responsible for paying it. If you can’t pay it, the surety bond will. The bond company will check your credit and perform a background check before issuing the bond. You pay a percentage which is dependant upon your credit. Obtain a legal process agent. This is also required by the FMSCA. There needs to be a legal process agent in every state you do business in. There is usually a $50 fee. Get insurance. Once you’ve filled out all of the appropriate paperwork and have obtained your Motor Carrier Number, you must get general liability and cargo insurance. They are both required. Of course, taking a training course is not required but will help you get a leg up in the industry and earn the most money for each shipment. What is a Freight Broker’s Salary? A freight broker’s salary can vary greatly. Indeed.com puts the average at $51,032, Linkedin puts it in the range of $30,000-83,000, and Careeronestop.org has it at $25,000-65,000. Payscale.com has it at the highest with a range of $41,940-143,000 but all of these ranges are dependant on several factors including experience, skills, and knowledge of the industry. Having a large database of contacts is important to earning a higher salary as a freight broker. Being able to provide your clients with excellent service with affordable rates will build lasting working relationships. Some states bring in a higher salary for freight brokers than others, the highest ones being CT, WA, OR, NE and Washington D.C. The salary for these states is higher than the national average. Typically, freight brokers who make the highest salaries are those who have freight agents working for them. A freight agent is an independent contractor who coordinates shipments with carriers but they aren’t required to have the insurance that a freight broker does. They work for the freight broker who carries all of the insurance and business licenses and expenses. The more shipments made, the more commissions are earned which is why the most successful freight brokers hire freight agents to work for them. Being a freight broker can be a lucrative job for the right person. The freight broker industry is expected to remain strong. More and more people rely on online shopping each year which means more trucks on the road. Even if those trucks eventually become self-driving vehicles, freight brokers will still be in high demand. DirectFreight.com is an essential tool for freight brokers. It’s an easy-to-use load board that allows you to find loads and carriers, as well as provides destinations, load specifications, credit reports, and has useful tools such as mile calculators, fuel price data, and other useful features, all for a low monthly fee. Call us today at (888)894-4198 or go to https://www.directfreight.com/home/ to sign up for a free 15-day trial. With DirectFreight, your freight broker company will have the tools it needs to become a success. With about two weeks left until what may be the final deadline for a new NAFTA this year, Mexico and Canada are suggesting it’s up to President Donald Trump to help make one happen. Read more here. Another carrier has announced a move toward a base salary compensation structure for over-the-road company drivers. Washington-State-based Smokey Point Distributing, a Daseke Inc. company, says that starting June 1 it will pay qualified solo over-the-road drivers with flatbed hauling experience an annual salary of $65,000 and each qualified and experienced member of a driving team an annual salary of $75,000. Read more here. A trio of Republican congressmen sent a letter to the leader of the Federal Motor Carrier Safety Administration calling for his support for ELD exemption for small-business trucking firms. In a May 8 letter, U.S. Reps. Greg Gianforte, R-Mont. ; Steve King, R-Iowa; and Brian Babin, R-Texas, asked FMCSA Administrator Ray Martinez to grant an exemption request filed by the Owner-Operator Independent Drivers Association. The request seeks relief from the ELD mandate on behalf of small business truckers with a proven safety record. Read more here. New York Gov. Andrew Cuomo announced May 8 that an additional $125 billion will go toward infrastructure investment over the next five years. Read more here. Nikola Corp. has sued rival Tesla Inc. for $2 billion, claiming Tesla infringed on U.S. patents Nikola received on cab design, including wrap windshield, midentry door, fuselage, fender, side cladding, and the overall design of a semi. Read more here. Spending on truck freight services surged nearly 25% and freight shipments grew 12.6% in 2017 as the economy expanded and the trucking industry paid more to obtain capacity and on driver compensation, according to the U.S. Bank Freight Payment Index. Read more here. The Federal Motor Carrier Safety Administration has updated its list of hours-of-service violations used in the Compliance, Safety, Accountability enforcement model. Read more here.